The Legend of Zelda producer Eiji Aonuma uses the Zelda Miiverse to confirm a western re-release for the Oracle games. A short while ago the Japanese eShop received a treat in the form The Legend of Zelda: Oracle of Ages and Oracle of Seasons, two classic entries in the Zelda franchise that hadn't seen releases since their launch on the Game Boy Color. There was originally no word on when, or if, the two games would be joining the eShop in regions outside of Japan. Word is out now however, and it points to summer. The announcement came via Eiji Aonuma, producer of the Zelda franchise. "Our plan is to release these two games in other territories some time before summer!" 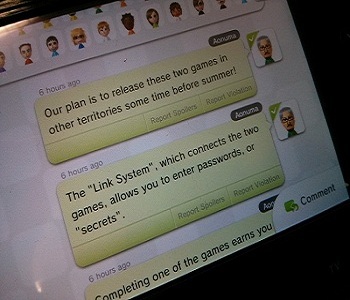 said Aonuma, posting a message on the official Zelda Miiverse board. Though no specific release date was mentioned, it's nice to know for certain that the games will be joining the ranks of the North American eShop in the next few months. While the re-release of the Oracle titles is great on its own, it's just generally nice to see some steady support for the eShop, especially considering some of the problems Nintendo has had when it comes to its digital storefronts. The Virtual Console on the Wii saw a notable drop in new releases a few years after its launch, and just recently the eShop made headlines when it was revealed, to some annoyance, that gamers who bought digital games for the Wii would need to pay for them again on the Wii U. Whatever Nintendo's faults may be when it comes to digital distribution there's no denying it has games people want, and in a few months the Oracle duo will be joining the list of titles we'll be buying and then probably buying again and again for years to come.